Job listing, finding or booking between Tradies and Consumers with honest reviews and profiles without having to worry about quality of work or potential scams is not available through the current online solutions in the Australian marketplace. 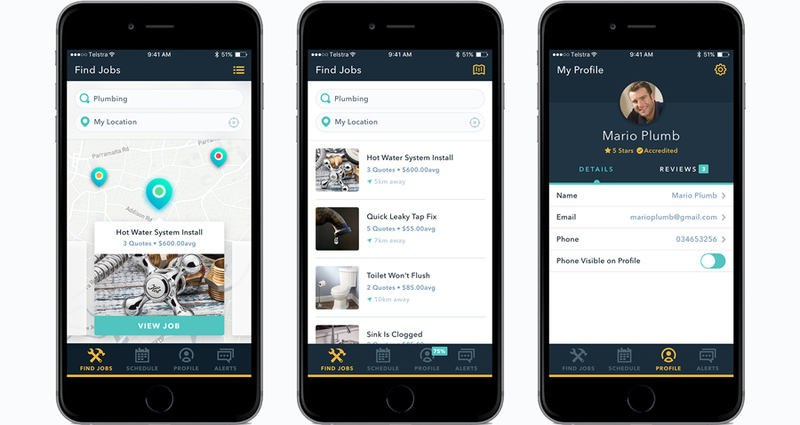 We created a solution through a modern mobile application that enables Tradies and Consumers to transparently and honestly list or book jobs then seamlessly interact through the job commencement and completion lifecycles. Adam from Go Tradie is an entrepreneurial project manager in the finance industry who hails from south London where he originally worked as an electrician. He came to us with a collection of insights into the tradesperson industry and competitive analysis into some of Australia's largest consumer to tradie booking services. Speaking with Adam's local community and trawling through forums had left him with the impression that consumers have a general distrust for tradies and all have their own story of poorly completed work or poorly quoted jobs that have burnt deep holes in pocket for customers and left tradies with poor reputations. Adam’s goal was to fill a gap in the market where a solution did not exist that enabled consumers to find and book tradies with a level of trust while also helping honest tradies win and retain great customer relationships. He came to us looking for someone to bring his idea to life visually and scope out what the solution should look like both functionality and technically. Adam’s experience as a tradie was limited to his time living in the UK. His prior networking and research had been informal and as such, focused around the opinions of existing solutions in market for tradies and consumers. We worked with Adam to define a clear list of challenges and pain points for tradies as they interacted with their customers through a set of profiling and behavioural questions that were circulate through his tradie network. The survey was designed to obtaining responses detailing the interactions and perspectives of tradies as they obtain and work with their customers. The result of this survey were used to define his core user personas. 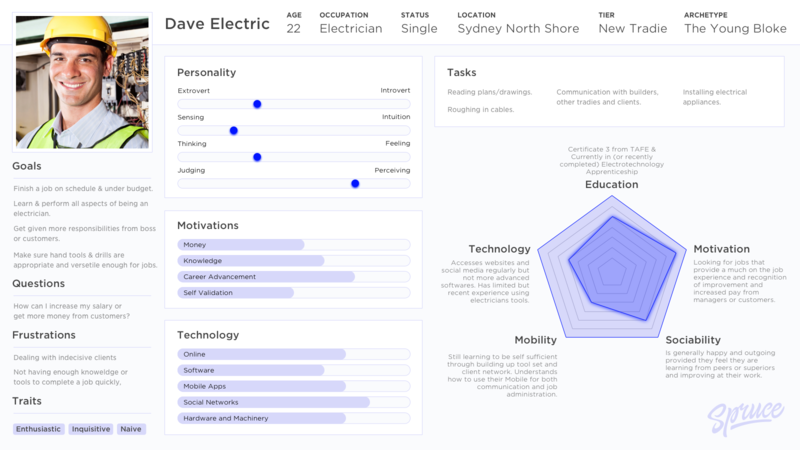 These user profiles are a collation of common demographic, behavioural and emotional information based on user interview and survey responses. Our team met with Adam and some of his key advisors over two moderated user story mapping sessions. During each of these meetings we worked collaboratively to map all the tasks that may be performed or goals that might be achieved over the course of creating, booking, performing and completing a job for both tradies and their customers. These sessions also allowed Adam and his team to brainstorm how these tasks or goals might be achieved or assisted through the use of technology and brought to light the need for technologies including display of map data and geolocation tracking. This lead to the conclusion that the solution would be best composed as a mobile app. Adam circulated the story maps with his community and advisors, collection preference and votes against the result of our brainstorming, coming up with a set of high priority methods in meeting tradie and consumer needs, wants and goals across the entire job booking lifecycle. 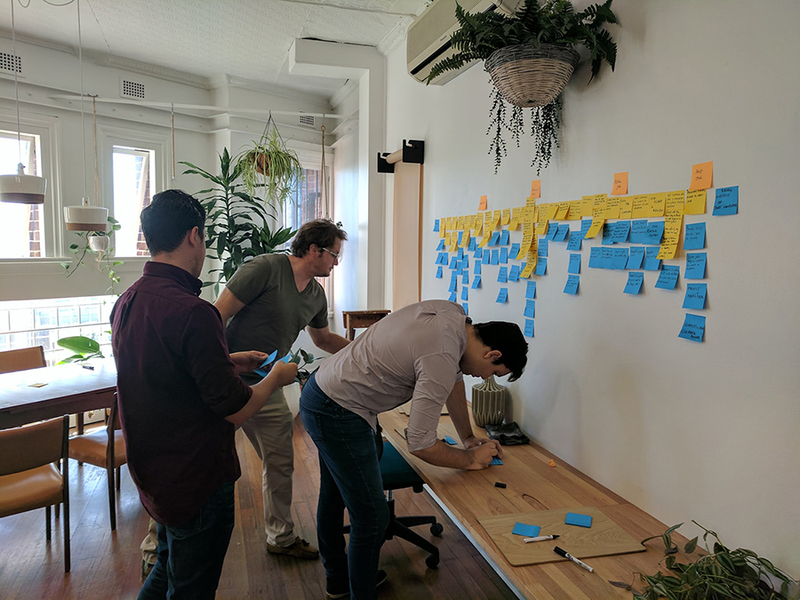 We run a moderated workshop with key client stakeholders and their user base to define a user story then brainstorm and vote for ideas based on the tasks and goals defined through the story. With a set of features that had been validated within Adam’s community and advisor group in hand, our team began creating a feature list for the application that spanned across key tradies and consumer timeframes and solved key pain points. We grouped individual user task or goals into these features or ‘epics’ while also factoring in common required features such as registration and user profiling. To assist our designer in visualising and a development team in technical planning, the defined tasks and goals were all rewritten into a user scenario map, that included clear and specific verbiage and used consistent terminology, concept labels or naming of system components. The map was also used to identify technical, legal or strategic considerations while noting any concerns that may be relevant in the eventual development of the app. These considerations and concerns were used along with our teams design expertise to define the feasibility of each feature set. When Adam moves into development this map may be used to iteratively frame and adapt the scope of his MVP and future product enhancement releases. Scenario mapping acts as the crux point of the human centered design process, converging research findings and product ideation into a clear and concise brief for visual design or functional specification for development. Our UX designer used the user scenario map to create the mobile wireframes, factoring in all UI elements required in achieving the functional scope for the app. At this stage, our designer was given the freedom to dictate potential chronology and importance in display of each scenario instead of having these aspects dictated through prescriptive user workflows or information architecture diagrams. This allowed for the rapid creation of unique and circumstantially appropriate click and input patterns that ensure usability was measured against the visualised elements. Go Tradie has a great example of this through an onboarding workflow that allows users to view the applications competitive differentiators by allowing tradies access to potential job postings and consumers access to tradie profiles pre registration (without the need for them to input any of their information). Ensuring layout, key elements and all user journeys are visualised and validated through lowfi clickable screens that are created and updated rapidly. In order to come up with an art direction that was both unique, matched Adam's taste and was appropriate for the apps users, we put together a moodboard displaying a range of potential art directions. After reviewing and refining these with Adam we agreed on a range of potentially applicable look and feels and used these to begin UI concepting. We put together two fresh concepts using the unique UI colour sets that adhered to the GoTradie brand. The concepts were designed to be memorable, yet always putting ease of use above being overly flashy. Special attention was paid to ensuring calls to action and key app functions had large controls and typography that would be easily usable by tradies working on job sites. 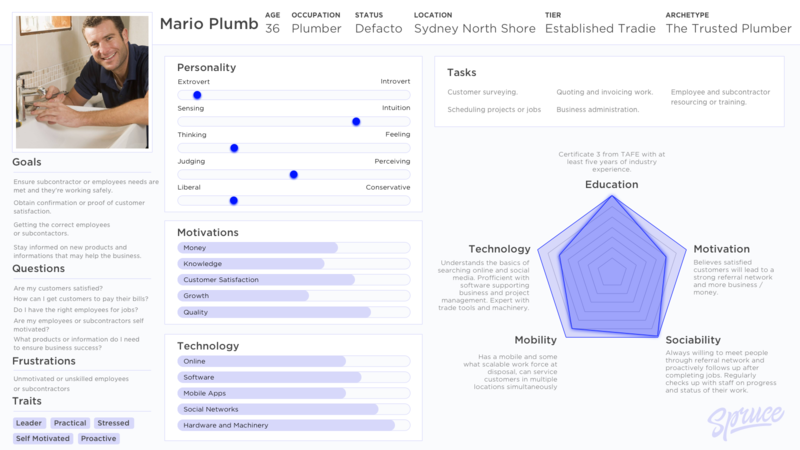 Social cue's such as rating, profiling and recommend initiation of communication between tradies and customers where given key positioning across screens in line with findings across the two key tradie user personas that identified these aspects as needed or wanted across the job booking lifecycle. Once we’d arrived at a concept that all stakeholders were happy with, we rolled out the UI style guide across all wireframed app screens. This gave Adam a full picture of how the UI played out visually, how flexible it was and how coherently it could work across a large set of user flows. With key user flows designed in high fidelity, we flesh out a design system covering all components that might be used in future screens and features. This system becomes your product bible and all developers and any future designers should follow it to the pixel to ensure a coherent user interface style. After all UI designs were approved, we put together a clickable prototype in Invision that not only gave Adam something concrete to put in front of potential investors, but could alos be used in gaining additional user validation against the UI style and feature set that was being proposed for development into the MVP. It’s at this stage we began putting unique UI animations together to give the app an extra level of polish visually and a set of micro interactions to reinforce and promote usage of interactive UI elements and increase the usability of the application. All key screens and user flows set out by the ideation phase will be mocked up in a high fidelity clickable prototype with polished, pixel-perfect artwork and modern user interface patterns, all working in harmony with your brand.